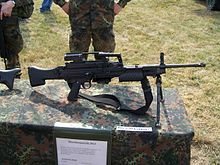 The FN Minimi, one of the most popular light machine guns among NATO countries. Heckler & Koch MG4 of the German Army. Chinese soldier with light machine gun. Mk 48 machine gun used on patrol in the Afghan mountains, 2009. A light machine gun, or LMG, is a type of machine gun that is designed to be used by only one soldier. Light machine guns are often used as squad automatic weapons. The caliber of cartridge that modern light machine guns fire are usually less than medium machine guns. They are also usually lighter. However, a light machine gun can be noticed by the role it plays in a battle. Some machine guns, such as general-purpose machine guns, can be used as either a light machine gun or a medium machine gun. If it uses a bipod and fires in short bursts, it is a light machine gun. If it is used on a tripod and fires automatically for a long time, it is a medium machine gun. It is possible to fire a light machine gun from the hip, or on the move. This pins down the enemy. Marching fire relies on this. Otherwise, light machine guns are usually fired while lying down and using a bipod. Many light machine guns (such as the Bren gun or the M1918 Browning Automatic Rifle) got their ammunition from a magazine. Others, such as the MG 34, could get their ammunition from either a belt or a magazine. Modern light machine guns are designed to fire more bullets that have a smaller caliber. Because of this, they are usually belt-fed. Light machine guns were first brought into service in World War I to make the infantry more powerful. By the end of World War II, one light machine gun was given to a section or squad. ↑ "Bren light machine gun". Turrets snd Tracks. 13 October 2011. Retrieved 13 October 2011. ↑ FN Herstal (13 October 2011). "FN Minimi". FN Herstal. Retrieved 13 October 2011. This page was last changed on 7 August 2016, at 19:58.